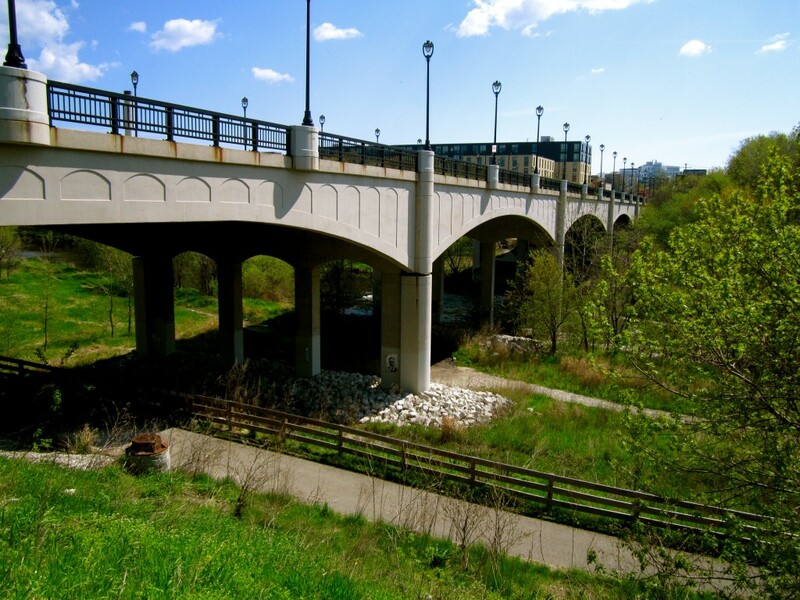 Completed in 1921, the 1,385-foot-long North Avenue Viaduct was the fourth bridge at this location and certainly the most beautiful. Using state-of-the-art (for its era) construction techniques, the reinforced concrete bridge featured large public comfort stations (restrooms) at either end, along with “detailed neoclassical ornamentation,” such as railings supported by 3,000 concrete balusters, the casting of which was the full-time occupation of seven workers during the bridge’s two-year construction. But seven decades of wear and tear can claim even an engineering masterpiece. 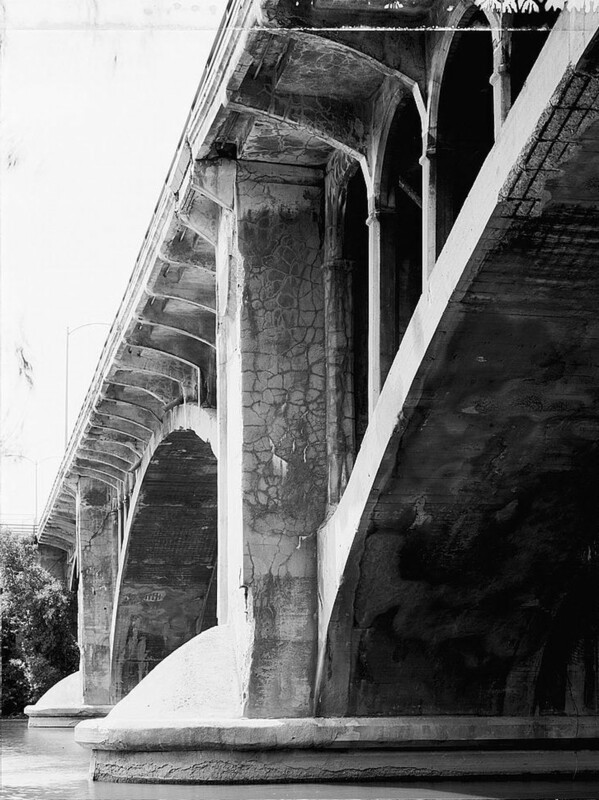 In 1984, the Public Works Department decided the old viaduct was beyond repair and started planning its replacement. Projects of this magnitude take time, and by 1987 increasingly worried city officials had shored up parts of the viaduct with timber, banned vehicles over 10 tons, and were conducting weekly inspections. In 1988 Milwaukee newspapers ran a legal notice from the city offering to sell the bridge on the condition the buyer disassemble the 1,385-foot-long structure, rebuild it elsewhere, and maintain it forever. To sweeten the deal, the city offered to pay up to $1.3 million of the relocation costs. This would be, mused Milwaukee Sentinel reporter Amy Rinard in the June 30, 1988 edition, an opportunity to own a piece of Milwaukee history – a really big piece. Her story also noted the offer of sale was a legal formality mandated by the viaduct’s status as a registered historic landmark. City officials quoted in the paper spelled out the obvious: It would be impossible to move the bridge. On December 26, 1990, the bridge closed to traffic and demolition work began. The contractor, Lunda Construction of Black River Falls, Wis., vowed to have vehicles moving on a replacement bridge in just one year, with full completion in mid-1992. The old bridge had served the city well for many years, and the remarkable story of its design and construction are today preserved in the Historic American Engineering Record (HAER) housed at the Library of Congress. The following details are taken from the HAER report compiled in 1987 by historian Edwin Cordes of the Wisconsin Historic Bridges Recording Project. James C. Pinney, former Superintendent of Bridges and Public Buildings for the City of Milwaukee and Marquette University’s dean of the College of Engineering, designed the bridge. In case you were wondering, it’s a complex open spandrel, ribbed-arch support system. It was one of Milwaukee’s largest bridges with a total distance of 1,385 feet including retaining walls, a plate-girder span over railroad tracks at its western end, and concrete approaches. Three arch spans crossed the Milwaukee River, which was very wide at this point thanks to the nearby North Avenue dam. Each arch is actually side-by-side 16-feet-wide ribs. The piers were hollow with walls 30 inches thick. Construction of the viaduct commenced on July 20, 1920 with a $628,000 contract awarded to a local firm, Klug and Smith Co. The two river piers were completed to the springing lines of the arched ribs by the end of December 1920 to comply with a request to expedite that part of the construction. Local ice companies, big business in the pre-refrigeration 1920s, were anxious to have the river lever raised to normal so they obtain their usual winter harvest. On December 15, 1921, Pinney’s bridge opened. It had taken 16,000 cubic yards of concrete, 182 tons of structural steel, and a daily workforce that fluctuated between 100 and 350 men, working three eight-hour shifts seven days a week. Dressed up with ornamental railings and harp-style streetlights, the present North Avenue bridge is a relatively nice municipal bridge although its arched concrete skirting, almost certainly intended as a tribute to the old bridge, looks awkward and tacked-on. When you think about it, that’s pretty much the opposite of the graceful solidity and flowing lines of the old bridge.